I want to give a huge plug to two buddies of mine from Sheridan: Adam Hines and Andrew Murray. We graduated together last year, and they've both gotten gigs in the TV animation industry. 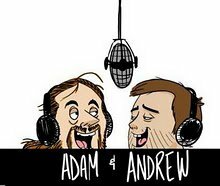 They have also recently started a new podcast called Guys With Pencils, and it's awesome stuff!